Between the years 1884 and 1937, the company mill and lumber town of Falk thrived in what is now the Headwaters Forest Reserve. In the late 1800s, Noah Falk and two other stakeholders became partners in the Elk River Mill and Lumber Company. 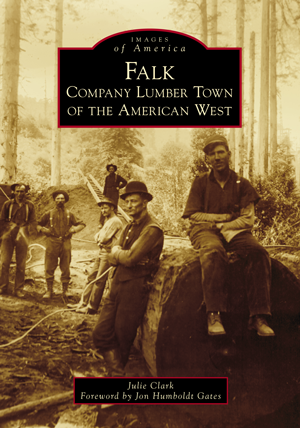 During this transitional time in logging history, Falk was able to capitalize on the relatively inexpensive price of land, cheap labor, and inexpensive logging technologies, such as the band saw and the Dolbeer steam donkey. Isolated from Eureka and within the backdrop of the industrial revolution, many changes and spikes in local and immigrant populations created an intricate company town of 400 people. Between the 1940s and 1970s, Falk became a ghost town until the vacant buildings eventually became part of the soil that now supports the Headwaters Forest Reserve, managed by the Bureau of Land Management. Julie Clark works for the Bureau of Land Management and is currently the Headwaters Forest Reserve ranger. She has conducted many Falk presentations to Humboldt County residents and portrayed some of the Falk residents in living history events. She holds a master of arts in social sciences from Humboldt State University. Jon Humboldt Gates, author of Falk’s Claim: The Life and Death of a Redwood Lumber Town and Night Crossings, is a fourth-generation Humboldt County native who now resides in Sonoma County. The Humboldt County Historical Society has been instrumental in contributing photographs and primary documents to this project.